Battersea Family Butchers share a love of fine meats and a passion for providing excellent service. After acquiring the long-serving Battersea shop, they quickly gained a reputation for the high quality of their products. Together they hold many certificates and awards. A former chef and freelance butcher, Luis Franco understands, first-hand, his clients' requirements and he has honed his skills over the last 14 years with many prestigious companies around London. Ricardo Perestrelo has been a butcher for 10 years. 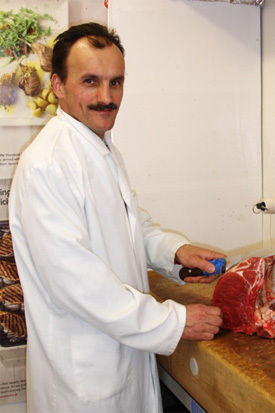 His arrival at Battersea Bridge Road follows a successful time at Brixton market and he brings to the table invaluable experience as meat-sourcing consultant for many businesses in and around the South London area. Battersea Family Butchers is located in the Battersea Bridge Road. The nearest train station is a 15 min walk from Clapham Junction. View map location. Do not hesitate to ask for a list of our products.